Not only is the total number of customers served by the big six shrinking, but it is doing so while the total number of customers is rising. Ban Mac crunches the numbers. The big six energy companies in Great Britain have been experiencing a difficult time lately. Elexon data shows that from March 2016 to June 2017 they lost 1.22 million electricity customers – this represents a drop of 4.6 per cent, or roughly 76,000 customers a month. For consumers, the choice of alternative supplier has never been greater. On average, five new suppliers will actively enter the market every three months. With almost 100 suppliers, competition is really heating up. This exodus of customers from the big six is reflected in a recent financial result. Scottish Power announced a 76 per cent drop in its net operating profit for first half of 2017 across its generation and supply business compared to the same period last year: from £205.9 million to £48.8 million. 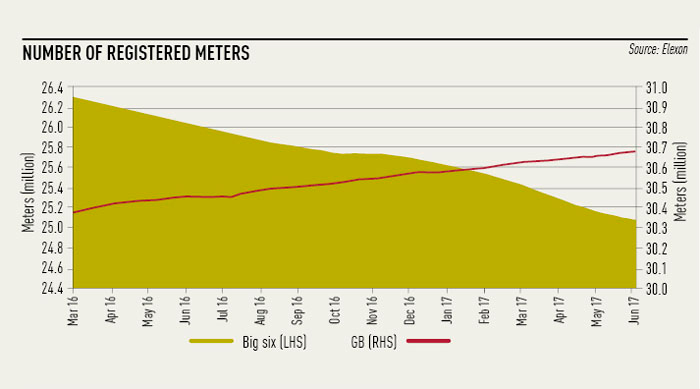 Chart 1 shows the number of meters registered to the big six suppliers compared to the total number of meters in GB. So how indicative is this decrease compared to the whole UK market? Well, during the same period (March 2016 to June 2017) we have seen the total number of electricity meters in GB grow by 300,000. That’s approximately an extra 19,000 customers the big six are failing to capture each month in addition to the customers they are losing. Where have these extra 300,000 customers come from? The answer can be found in single rate domestic metering figures, otherwise known in the industry as profile class 1 metering. As illustrated in the customer growth chart opposite, the number of domestic customers with single rate meters grew by a staggering 470,000 between March 2016 and June 2017. This can be partly attributed to the number of new homes built in the UK, but also an effort from suppliers to move customers on multi-rate domestic tariffs (profile class 2 metering) to single rate tariffs. Back to the original conundrum; the pie chart shows where these lost big six customers have fled to. The data is grouped based on the number of meters each supplier had in March 2016. Suppliers that had zero customers, or were non-existent at this time, are categorised as “new suppliers”. It would seem the suppliers that took most advantage of the big six’s losses were suppliers that were not too big (up to 250,000 meters), and not too small. So what is the driving factor? Analysing tariff prices over the past quarter (Q2 2017) reveals that new suppliers, and suppliers up to 50,000 meters, regularly offered the 15 cheapest tariffs to domestic customers. From the 15 cheapest domestic tariffs available, 43 per cent were regularly offered by new suppliers, and 40 per cent from suppliers up to 50,000 meters. Suppliers up to 250,000 meters accounted for 12 per cent, while only 5 per cent of the 15 cheapest domestic tariffs were regularly offered by the big six. In conclusion, it is clear that there is a strong appetite from consumers to shift away from the traditional big six suppliers, and based on current trends this is set to continue. For new and emerging suppliers, it would appear competitive pricing is the business model of choice. However, once a supplier becomes established, it can begin to grow the business through different means.